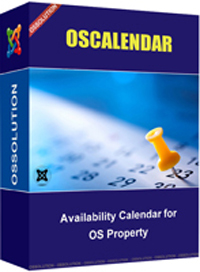 OS Calendar provides availability calendar feature for properties of OS Property. OS Calendar 6.0 even better, it allows administrator/ agent or owner to be able to setup price for their apartments, hotels, villas, holiday or camp site in their OS Property system. There are a lot power features in new version of OS Calendar like Flexible Pricing, Multilingual, Flexible Payment plugins, Report Functionality or SEO Friendly etc. It will help you to make the best property rental website. Explore the powerful features that will help you create a Holiday or Booking Site that looks and works professionally! These are just some its huge amount of features! Book Online: rooms, villas, apartments etc of OS Property's properties. Detailed availability calendar with booked and free dates information. Set prices based on dates, price automatically calculated based on dates and prices and number of rooms. Pay online with PayPal payment gateway, booking will be updated and emails sent. Advanced pricing manager assists you with the price settings for any days, months, weekends, specials offers etc on any room of properties. With a few clicks, set weekend pricing with minimum stay. Prices are presented within the tables describing cost and duration of stay. We have included some static fields to help you start your project quicker. These fields are commonly used on property rental / holiday websites and can be turned off if needed. Fields are based on categories so you are free to customize them. If you need more fields you can create any custom field: text, dropdown, text box, checkbox etc. As OS Property, OS Calendar fully supports multilingual content. All elements like rooms or custom fields can be translated into any language. For non UTF-8 characters we are using URL aliases. OS Calendar supports multiple payment plugins. In default installation, you will have Payment and Offline payment gateways. But you can install or develop new payment plugins as you can. In future, we will release more payment plugins, and many other customers can use this extension. OS Calendar provides the Report function, it allows administrator to generate the Report with many criteria. You can have report with all reservations required data with a few clicks. Each email that is being sent by extension has it's own template that can be edited. This can be done in Email templates management. Templates use variables so no programming skills are needed. We have made a great effort to ensure that our extension is completely Search Engine Friendly. We have made sure all pages will be correctly indexed by search engines. Additionally each listing has its own SEO settings to adjust. It is also integrated into Joomla Breadcrumbs. The OS Calendar developer team are proud to announce the release of OS Calendar 6.0. This is a first release for the 6.x series of OS Calendar and addresses issues introduced in previous versions and introducing new function for Rental system. In previous versions, when you use OS Calendar, you must create Rooms for Properties (of OS Property component). And then, you should setup Price, Availability status for those rooms before customer can make the booking on rooms at front-end of component. This work is quite suitable with Hotel or Rooms renting, but if you are owner of Apartments, Villas .etc, you won't able to use OS Calendar, because you can't create rooms for your Apartments, Villas .. and customers won't rent one several rooms of one apartment or villas. Understand it, we decide to improve OS Calendar, to make it to suitable with Rental properties. Now, if you go to Configuration page of OS Calendar, you will see the configure option Enable Room. If you select this field Yes, you will need to create Rooms for properties as previous versions, select No if you want to be able to setup Price, Availability status for properties (of OS Property component). As you know, there is the big improvement on OS Calendar 6.0 so we encourage you to download latest OS Calendar version to get new improvement. And please update the languages (through Translation tool at Back-end of OS Calendar ) if you are using different language than English.